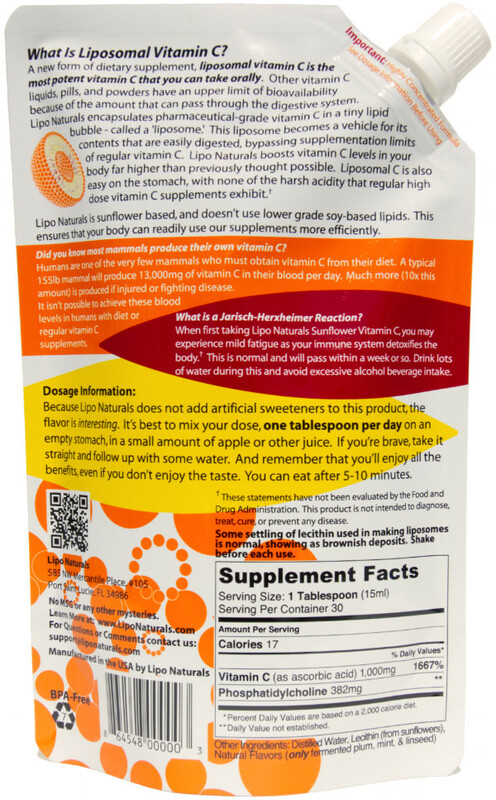 Lipo Naturals Liposomal Vitamin C is the most potent vitamin C that you can take orally. Have a Lipo Naturals lifestyle and want this product automatically shipped to you? ...We'll give you 10% Off your orders, starting now! 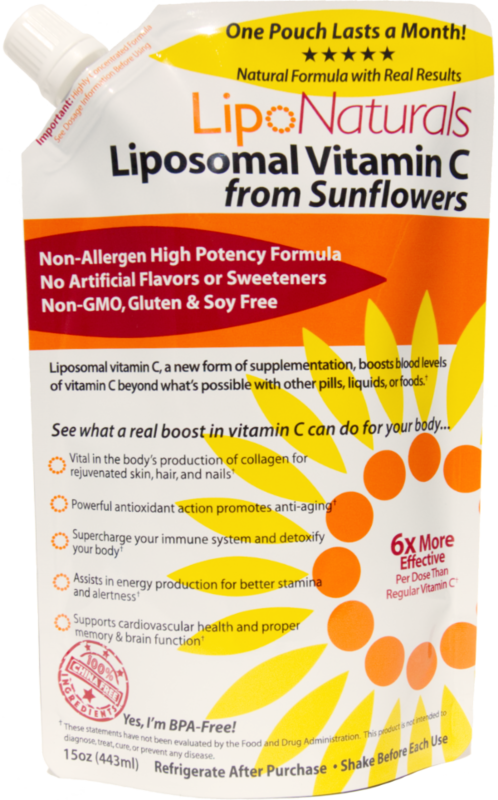 Now Buy 2 or More And Get Them Shipped FREE to the U.S.
Lipo Naturals Liposomal Vitamin C is the most potent vitamin C that you can take orally. Our liposomal C provides real anti-aging benefits from the inside out like improved skin, hair and nails, boosted immunity, and higher energy. Unlike most any other liposomal C, our natural non-allergen formula is 100% China-free (Quali-C) with no artificial preservatives, no soy, no gluten, no alcohol, and no artificial flavorings or sweeteners. It's made in the USA by Lipo Naturals. Most of our customers notice the difference in health and wellness after only a month. 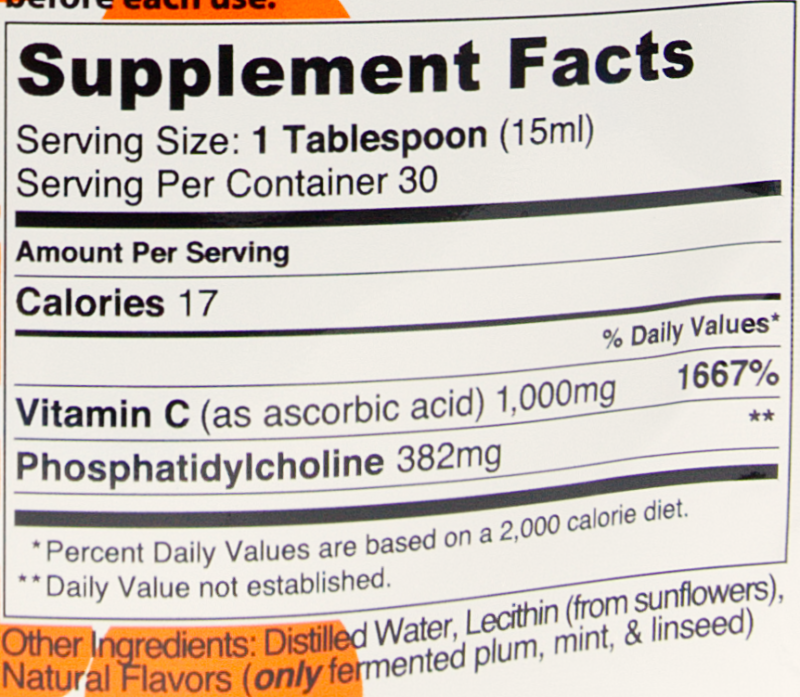 Our product is delivered as a liquid supplement in a resealable screw-top fresh pouch. Recommended dosage is one tablespoon per day. Each pouch contains enough for a month's worth of goodness for a single happy human. I’m happy a friend introduced me to Lipo Naturals. I’m very happy with the product and will continue to take it. I do feel good. The one thing that is difficult is when I travel I can’t take it with me because it needs to be refrigerated [From Lipo Naturals: You can take it with you! Just return to refrigeration when you can. See our FAQ.] That is the only draw back but a small one. My family and I been taking Liponatural C for a while now, our immune system is stronger! The product is good, but the amount I buy is too expensive for me. Lipo naturals is a company of integrity and I have faith. Excellent product. Actually tastes good! Product was received quickly and well packaged. Excellent product. I enjoy taking it and feel energized by it! Your delivery method is ingenius and much appreciated. I know Iâ€™m getting the most for my money with your highly absorbable and assimilable supplements. Thank you!!! I liked the box that the product came in. I noticed great changes in my body, less pain and no more skin breakouts. I tried this product first before recommending it to my patients. I have been very pleased with the quality of both the Vit C and the Glutathione, I have not tried any of their other products yet but I have already recommended these to my patients. Been using this for a bit and like the fact there are no sweeteners in it compared to other Liposomal products. This is a great product and a great company !!! Great so far except the taste, just shoot it down and drink some ice cold water right after. I love this product. Subtle changes everyday for the better in my body. My daughter and I have been taking it for about a year and love it! Tastes a little funky but the benefits are well worth a few seconds of displeasure! Glad to know my family and I are getting the best vitamin c.
It works! Take it with organic juice. I have started taking Lipo Naturals and have found the taste unappealing when taken straight. I have tried it with organic apple and organic orange juice and that seems to help. So far feel great as it seems to be working. Must be powerful stuff. Clean Ingredients, Best one I found so far. 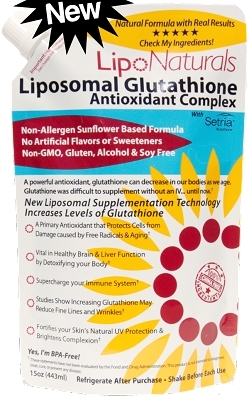 Lipo naturals is the best Liposomal vitamin c I have found so far with clean ingredients. I just wish the ingredients would be organic. Overall, we had good results with improving our immune system during winter. I know I'm going to use it all so buy 2 and get a great discount! We love this product. Excellent Buy! I will review more as time goes by because I just started taking this product a little over a week ago. I can state now, That the liposomal C doesn't taste bad, that it's easy to take and that I hope what people say high potency, liposomal vitamin C is capable of gets accomplished for me. I hope it does heal my arteries because Dr's tell me there is nothing more medicine can do for me. I love this vitamin, it gives me energy. This Vitamin C is clearly head and shoulders above anything Iâ€™ve tried before and if it does just half of the things promised it is worth double the price!! Been using this for two years. Great stuff. Thanks Lipo Naturals. I am an environmental sensitive and Lipo is a very necessary part of my health maintenance. I am daily bombarded with allergic stimulators which put great demands on my quality of life. I have tried numerous other Vitamin C products, including other liposomal vitamin C supplements. This is the best vitamin C I have taken. I can definitely tell a difference in my body when I take this and can tell if I miss a dose. Great Vitamin C! I miss it when I don't take it. Thank you so much for Liposomal Vitamin C! I can definitely tell when I don't have it for a few days--I feel like something is missing; not as much energy. I take it with orange juice, and I love it! I take a daily dose and find it keeps me healthy.